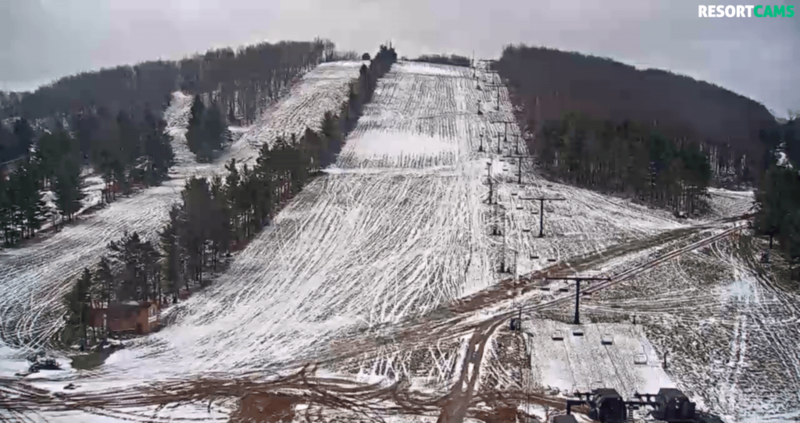 West Virginia Opens Ski Season; Four Ski Areas Now Open in the Southeast! 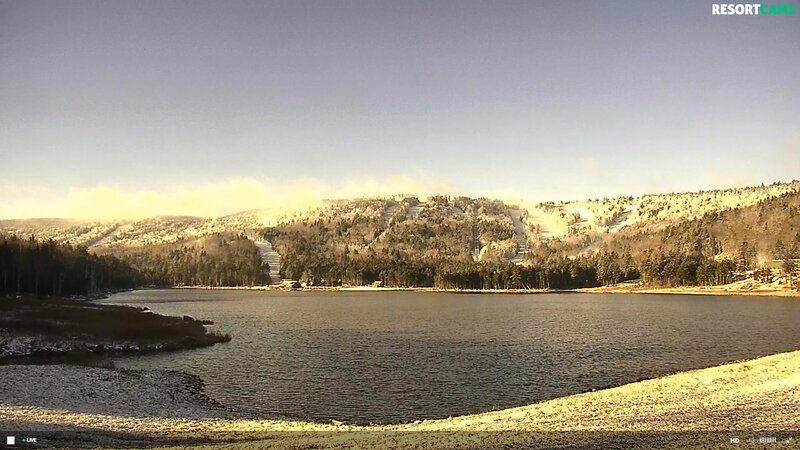 The photo of the day up top is a LIVE, untouched shot of The Basin Camera at Snowshoe Mountain. Looks pretty “golden” and that’s what the conditions ON the mountain will look like as well. 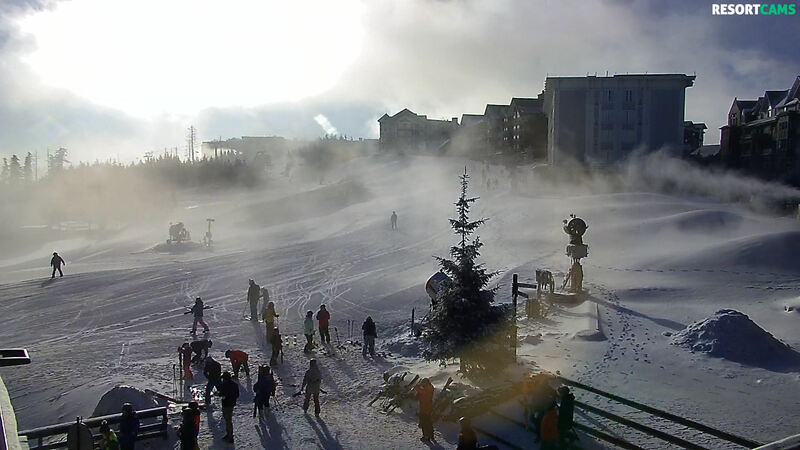 Snowshoe Mountain – Opens today with 1″ of fresh, new snow on the ground and manmade snow to add to that. They’ve had 4″ of natural snow in the last four days, with 3.5″ of that falling last Friday. They will offer day sessions only right now with 11 trails and 42 acres of skiable terrain today. Groomed conditions with a little dusting on top should be awesome. The crowd ready for the rope drop this morning had to have been awesome as we saw a lot of people hitting the slopes from Shavers. 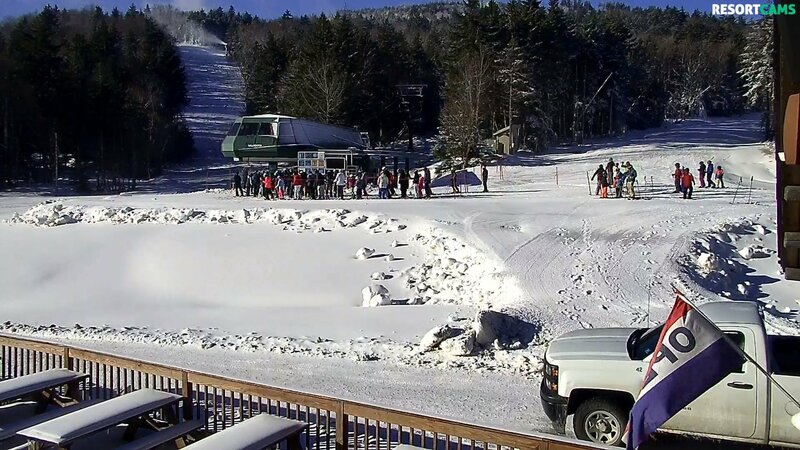 This is a great testament to Snowshoe’s effort to get open with a great products as fans hit the mountain early enough to create a bit of a line at the lift. A great sign at 9:15am at the base of Ballhooter. Click to Enlarge. 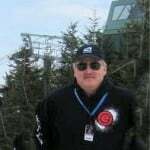 Shawn Cassell of Snowshoe posted, “…it’s going to be the best opening day in years. Join us for rope drop at 9AM this morning at the top of Heisler Way, right outside the Shaver’s Center. Snowmaking may be in progress on some open terrain. The Depot opens at 7AM this morning. The Junction opens for breakfast at 8AM. Appalachian Ski Mtn. looked awesome for their opening day the other day. TODAY they will be playing 7 slopes with a 8-16″ base and good coverage over all open terrain. Remember Midnight Blast Nights are in effect Friday & Saturday Nights from Opening Day through March 17. The slopes are open continuously from 9am until Midnight on these nights. The Appal Jam Terrain Park is open with features for all abilities including two flat boxes, a flat rail, and a step-down rail as well as various cat track features. Since all features are either medium or small in size, a park pass will not be required to enter the Appal Jam Terrain Park currently. 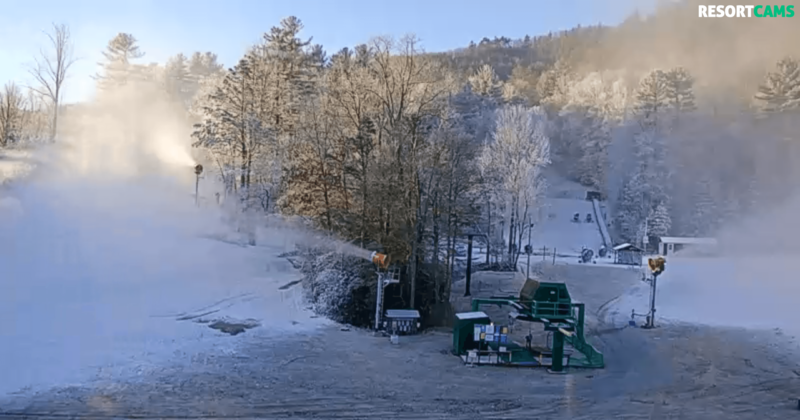 Cataloochee Ski Area is operating today with 4 slopes and a base of 14-26″ and a machine worked surface with two aerial lifts operating. They began snowmaking yesterday afternoon and will continue as temperatures permit. Although we do not like to make snow on guests, we will continue snowmaking during skiing hours if temperatures allow on Wednesday. Don’t forget that we are on our early season operating schedule of 8:30am-4:30pm Saturday and Sunday and 9am until 4:30pm Monday through Friday with the exception of the upcoming Thanksgiving holiday week. Frozen Falls Tube Park – Ski Sapphire’s Snow Crew will attempt to open the Frozen Falls Tube Thanksgiving Weekend.. it all depends on how cold we get. Boy Howdy, Are Some of You Guys Restless. …and a few people could, perhaps even have a bit of cheese with all the “whine” going on about how some of the ski resorts in the region are not yet making snow. Maybe a “chill pill” is in order. As I came into my office this morning, one of our team, Matt Laws, hit me up about messages that had been posted to social media over the last 24-72 hours complaining about ski areas that had not made snow yet. One really distraught young man has even gone so far as to create a dedicated Facebook page to “Making (Insert Ski Area) Great Again” complaining about how his home mountain had not made snow yet. We’ll leave to you guys to research Facebook to see the venom that is being spewed by more than a few “fans” of ski areas that have not yet made snow. That’s it, right now. By the way, those ARE the usual “suspects” that are open by this time each season. First, I have to thank my buddy, Joe Stevens for making the comment above. If you’re a fan of any ski area that has not opened yet, or which has not made snow yet – there are reasons….legitimate ones. What you guys and gals need to understand is that every owner, President and management team at every resort in the region ARE HUGE fans of all things snow. They WANT to be open right now. Sometimes the reasons are borderline weather patters, which is the case for most of the Virginia resorts thus far. Sure they’ve had a few nights that offered snowmaking temps, and then those were followed by rain, mild temps and even a significant ice storm that hit most of the area. The ice storm came at a PERFECT stretch of cold temps that would have allowed resorts like all those in Virginia and Winterplace Resort to make snow. However, that same ice storm took out power across the region and resorts were left with their hands tied. Perfect weather, but no power. Winterplace Resort (and the power company) was still pulling trees and limbs off of power lines and snapped poles just two days ago. While they have regained power to core buildings, they still had no power for snowmaking. 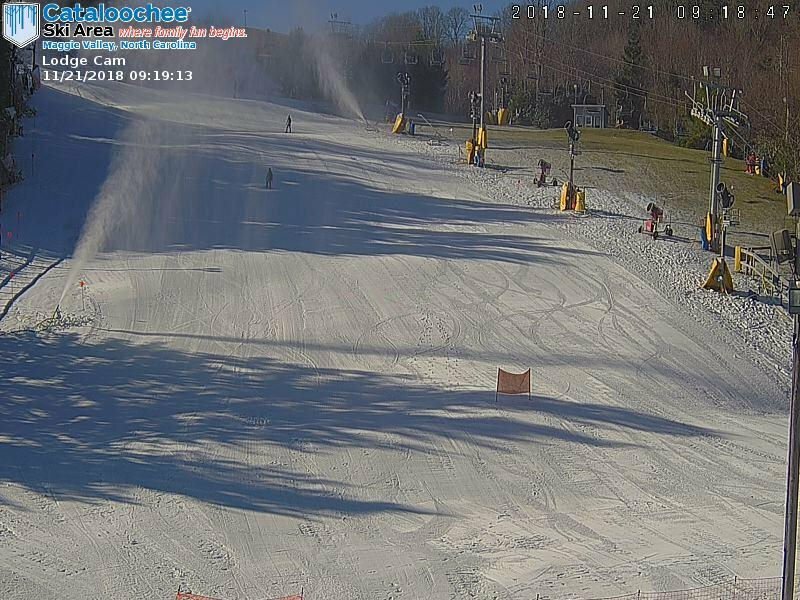 Wisp Resort has caught some real complaints from disgruntled fans who are looking just north and west at Seven Springs and Snowshoe…and they are frustrated that Wisp isn’t making snow right now. Wisp actually has received 4-5″ of snow recently and yet even with temperatures right now hovering around 28°, they can’t make snow — just yet. By sunrise, 5″ of a wintry mix has accumulated in Garrett County. It’s slick and heavy and everyone is digging out this morning so please use caution. Wet bulb is still not ideal for flipping on the snowmaking switch but our teams are standing by. We want to crank and play in snow as much as you do! Getting too much humidity off the lake to form snow crystals and we don’t want a base layer of only ice. Think about that response. So let’s say they were to open with a sheet of ice…what would the complaints be like then? While many ski areas may crank and start making snow, they traditionally wait until early-to-mid December to open. Those would be resorts like Canaan Valley, Omni Homestead, Wolf and Sapphire Valley. In the case of Timberline Resort – if you’ve been reading our daily blogs, there is all manner of turmoil, controversy, fiscal and physical infrastructure issues happening there with real questions about whether they will even open this season. Owners of the mountain claim that they were going to be making snow and opening by Thanksgiving. That claim was made weeks ago and tomorrow is Thanksgiving…and we’re pretty sure nothing’s going on over there. We’re putting together another story on the issues and struggles at Timberline and we’ll share that soon. In summary though – just know that every ski area in the region has had significant to major growing pains and financial issues in their past. The ski industry is a “gambler’s business” and the owners of every resort are modern day, riverboat gamblers – doing anything and everything to make their mountain a success story. Thankfully, most of the region’s ski areas are in great shape in every way. However, the reality of the ski industry is with all of the investments in snowmaking and infrastructure, lift systems, etc…they are all one or two horrible winters away from fiscal issues of their own. In the case of Timberline…we’re pulling for you, my brothers…. Sugar Mountain is open with 5 slopes for day sessions only. Previous articleSnowshoe Drops the Ropes on the 2018-2019 Season tomorrow! 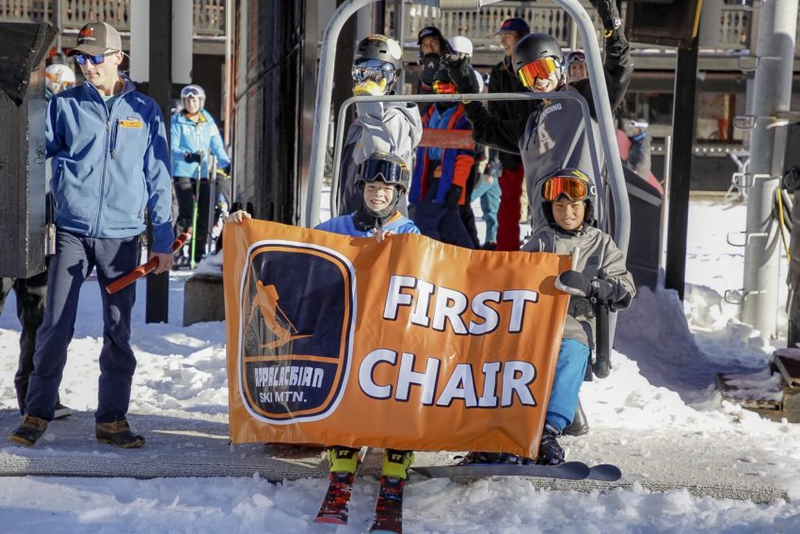 Next articleBeech Mountain Resort to Open Friday! November 23rd!